The six-armed god Vajramrita is portrayed seated in the centre of the composition embracing the goddess Svabhaprajna. Bright green is used to convey the “priyangu flower color” of his skin. 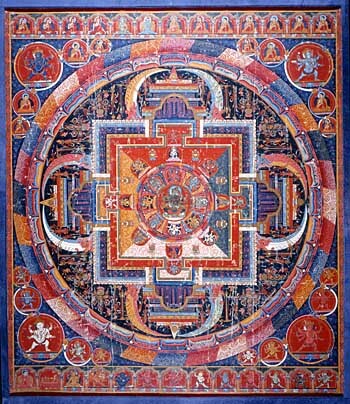 The couple is surrounded by eight other goddesses within the petals of a centrally placed lotus. The overall layout of the composition is constructed around the shape of this flower. Two male and two female guardians protect the access to the divine sphere: blue Bhrikutitaranga to the East, white Bhayabhisana to the South, red Hayarupa to the West, and green Gananayaka to the North. Like the principal god, all these secondary deities have three heads and six arms. In the cornerpieces outside the diagram, twenty variously sized medallions contain fierce three-headed deities, and monks who perhaps belong to the spiritual filiation of the Sa-skya-pa. This work is a crowning expression of the “Nepalizing” style in Tibet. Accordingly, most of the decorative themes are taken from Newar art: the dominant reds and blues, covering motifs of foliage and lotus tips, blazing flames, plant pilasters with outward- curving capitals, and trefoil arcades. The figures, with their slender proportions and chubby faces, belong to the same tradition. By the sheer number of details, rendered with the meticulousness of an illumination, this composition is particularly exquisite and sophisticated. Vajramrita is a tutelary deity who was notably in evidence in the 14th and 15th centuries. His name could be translated as “adamantine Ambrosia”. As a guarantee of their religious efficiency, sacred compositions such as this had to comply with a model that was pre-defined in iconometric treatises. By presenting the principal gods in the pantheon to the faithful, these mandalas played an important educational role.